Lathes have been in use for over 2000 years (for turning bracelets, for example), but their evolution was remarkably slow. Successful turning demanded a high level of skill and effort on the part of the turner, until the slide lathe started to find wider acceptance, c.1800. On the slide lathe, the tool is guided along the workpiece by slideways built into the lathe, rather than relying on hand-held tools. Movement is typically effected by leadscrews. No great ingenuity was required to develop slide lathes, and few lathe developments would warrant the word 'invention'. Rather, their acceptance resulted from the maker's ability to construct a lathe with the required standard of accuracy, usability, and durability. In fact the development of machine tools in general was remarkably slow, especially as they were needed to construct the new wonders of the age, particularly textile machinery, a field in which some of the most ingenious engineers were deeply engaged. Notable participants who excelled in both fields, who did advance the technology of machine tools, included Jacques de Vaucanson, Richard Roberts, Matthew Murray, and Fox of Derby. The slow development evidently partly reflects limited demand rather than lack of capability. More sophisticated lathes would only be wanted by industrialists if they could do the work more cheaply or more accurately than by the traditional methods. A lathe could readily be made self-acting, but an operator still had to stand in attendance. Economics would demand that the operator could work several machines at the same time, or allow the work to be done by cheaper labour. However, there was surely an incentive on the part of the turners themselves to have a mechanised alternative to the sheer hard work involved in paring metal off a rotating workpiece with a hand-held tool. Another barrier was the difficulty in accurately making long, straight guiding surfaces, pending the arrival of another late developer - the planing machine. Even more fundamental in the 18thC. was the availability of large pieces of good quality wrought iron. Another possible factor in the minds of potential purchasers is that although a self-acting slide lathe might be theoretically ideal for producing long, straight cylindrical surfaces, hand finishing would almost certainly be required to obtain a surface sufficiently smooth for, say, piston rods. Another factor in the growing appeal and acceptance of self-acting lathes was their ability to cut screws accurately, consistently, and relatively cheaply. It is noteworthy that by far the most sophisticated early lathes were not made for ordinary industrial production: they were used for producing scientific instruments (e.g. the screwcutting machines of Jesse Ramsden), clock and watchmaking, or for the amusement of rich clients (ornamental turning lathes). By far the most sophisticated early machine tools were clockmakers' wheel cutting machines, ornamental turning lathes and a version thereof used for copying medallion designs. Andrey Nartov in Russia produced remarkably advanced versions of these machines in the early 18thC. Some have survived in the Hermitage in St. Petersburg. Another was presented to a French gentleman by Peter the Great in 1717, and is on display in the Musee des Arts et Metiers in Paris. On the earliest industrial slide lathes the tool was positively guided in just one axis, parallel to the axis of the lathe spindle. Then came additional positive guidance in the direction normal to the axis (the cross slide). The next improvement was the mounting of an additional slideway on the cross slide. This was either set to move parallel to lathe axis, or was pivoted to allow it to be swivelled at an angle to the axis. The swivelling compound rest was probably introduced on commercial industrial lathes by Henry Maudslay. 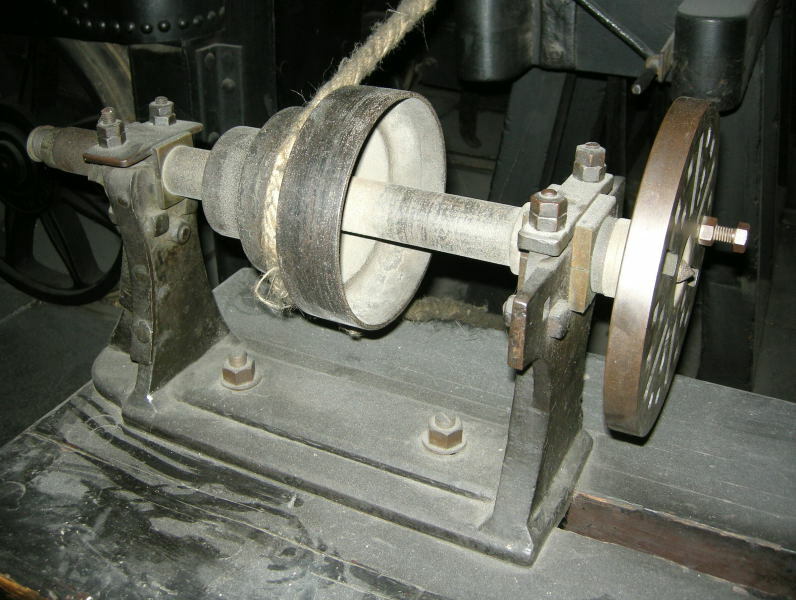 A very sophisticated swivelling slide is found on the 1780 rose engine of Mercklein, displayed in the Musee des Arts et Metiers. No doubt there are earlier examples to be found. 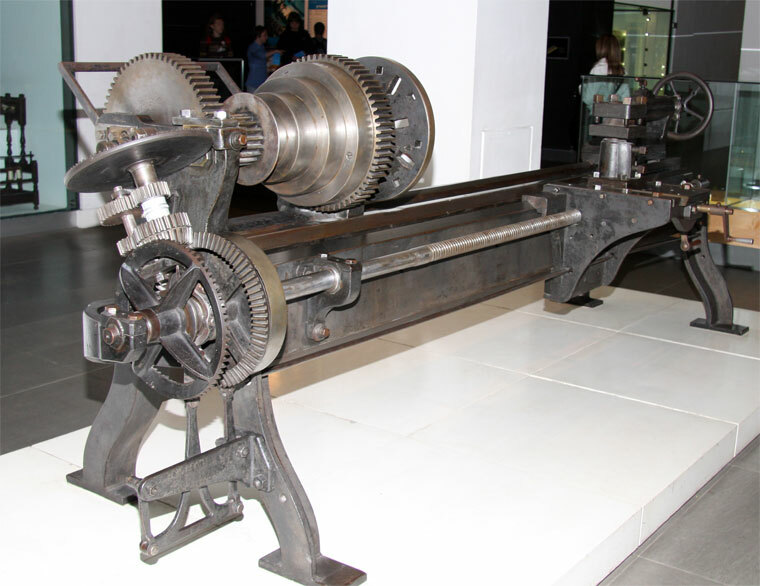 Vaucanson's lathe of c.1751, on display at the Musee des Arts et Metiers, is a remarkably early example of a true industrial lathe, of all-metal construction. The carriage was guided by accurately-made prismatic guide bars and moved by a leadscrew of fine pitch (turned by a hand crank). The workpiece was turned between centres, presumably driven by a belt round the workpiece or on a pulley attached to a mandrel carrying the workpiece. It was by no means a versatile machine, being made specifically for turning parallel calender rolls with a maximum length of approximately 1m. 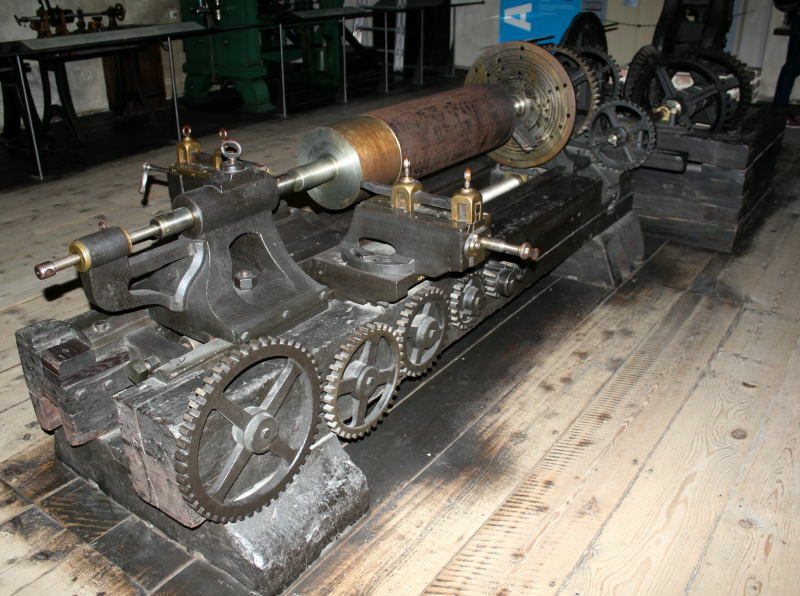 It could potentially be used to machine shorter worpieces, but this would involve moving and resetting one of the dead centres (there is no tailstock as such, and neither of the supports for the centres is positively guided to maintain a precise relationship with the carriage guides during repositioning). Note: 'Centres' in this context refers to the accurately-machine steel or iron points used to locate and support one or both ends of the workpiece during turning. 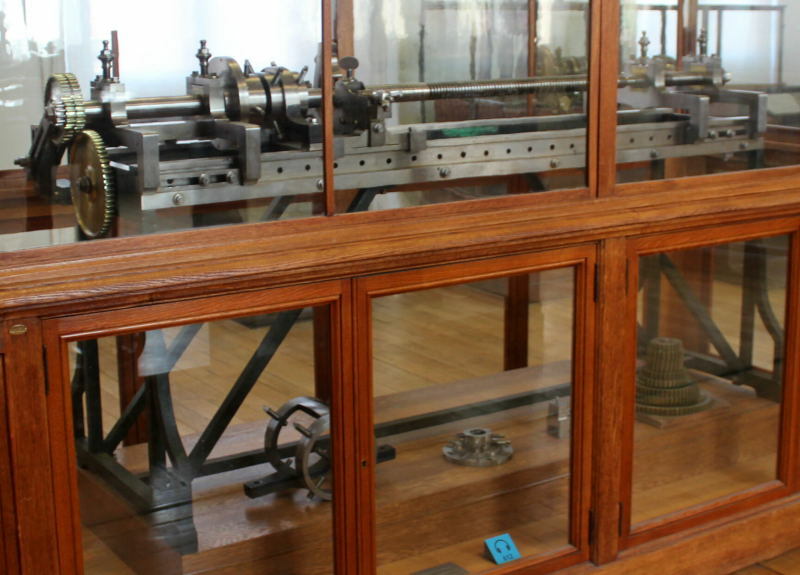 Senot's lathe of 1795, also on display at the Musee des Arts et Metiers, is an all-metal screwcutting lathe. It has a large diameter square-threaded leadscrew driven from the spindle by change gears, thus allowing threads of different pitches to be cut. It has a long iron bed which, unlike Vaucanson's lathe, unites and accurately guides the headstock, tailstock and carriage. Attempts to assign priority to any particular aspect of early industrial lathe design are often futile. 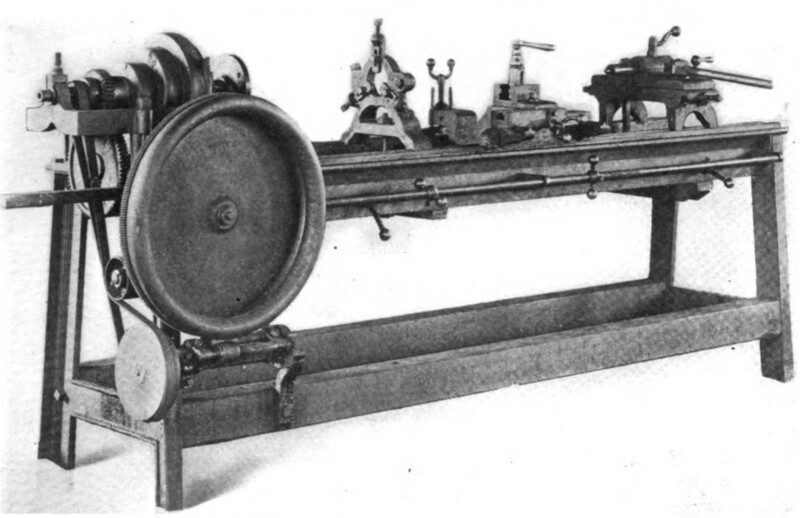 Surprisingly little is known about early slide lathes, dates of construction, or their makers, apart from some notable surviving examples, descriptions, or illustrations, including the products of Andrey Nartov, Jacques de Vaucanson, Senot, Henry Maudslay, Richard Roberts, and Joseph Clement. There is little doubt that Henry Maudslay deserves credit for screwcutting slide lathes finding widespread acceptance in engineering production. This contribution has often been misinterpreted by commentators to claim that Maudslay invented the slide lathe. Maudslay synthesised the key elements of precision lathe design and produced machines for industrial manufacturing purposes. Joshua Field stated that Maudslay 'introduced the general use of the sliding rest throughout his manufactory' . 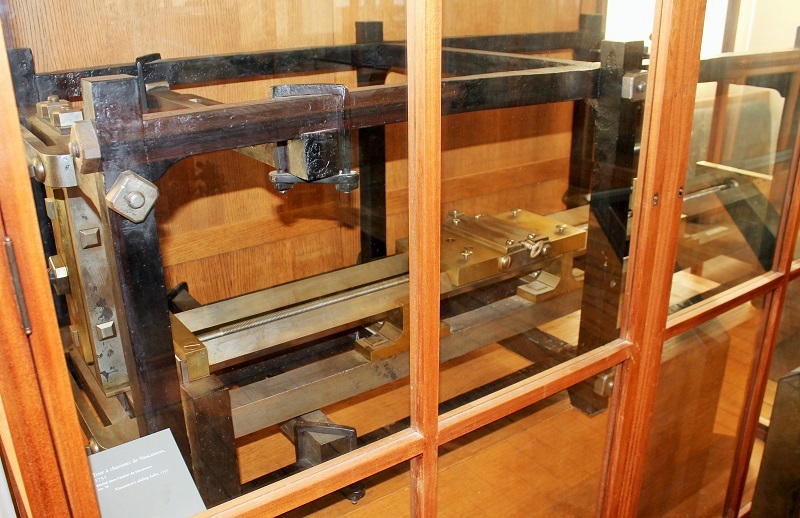 Maudslay's small 'c.1800' lathe, displayed in the Science Museum, was proably made between 1797 (when he left Bramah) and 1800 (when Marc Brunel sought his services). 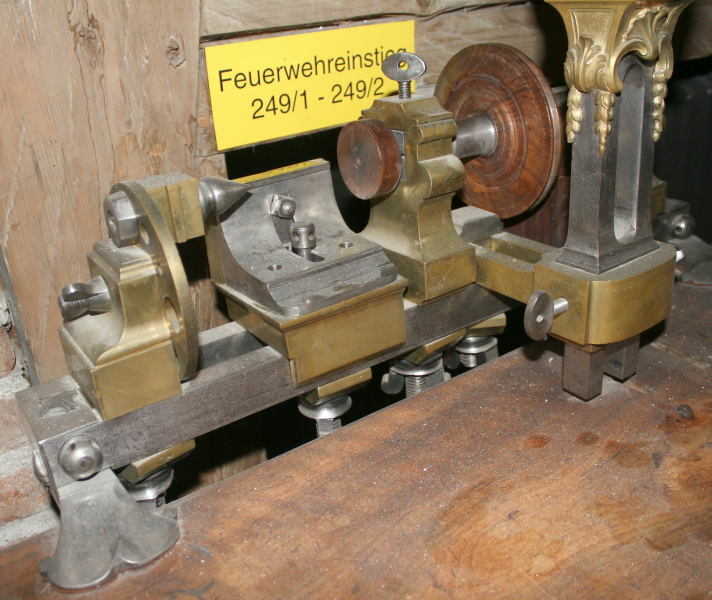 It had a carriage guided by accurate V-ways (previously applied by Vaucanson); a dovetailed cross slide (similar to that used on Lord Macclesfield's lathe of c.1740); a micrometer dial on the cross slide leadscrew (Mercklein's 1780 O.T. lathe), a leadscrew with change wheels for screwcutting (Henry Hindley, c.1740, Senot, 1795), and an accurately guided tailstock centre. Senot's screwcutting lathe of 1795 already had most of these features, but its toolholding arrangement was not ideal, and Maudslay's tailstock centre arrangement was arguably superior in principle, the centre point being machined on the end of a plain cylindrical bar located in the tailstock. On Senot's lathe (and Vaucanson's much earlier lathe), the centre was machined on the end of the tailstock's screwed spindle, making it more difficult to ensure concentricity when machining or remachining the point. At some point the more sophisticated lathes became known as engine lathes. There is no exact definition, but the term gnerally came to be applied to machines of all-metal construction, power-driven, self-acting - at least in the longitudinal direction - and equipped for screwcutting. However the term 'engine lathe' was earlier applied to a class of machines used for producing decorative patterns, non-circular shapes, etc. These machines are now more commonly known as ornamental turning lathes, or rose engines, but the term 'engine turned' is still used for machine-cut patterns on watches, jewellery, etc. There were also references to engine lathes in the industrial context. Some examples follow. In 1767 James Fox was advertising a range of products which included '... all kinds of engine, oval and common lathes.... He also performs every branch of Turning, on Wood, Ivory, and the different Kinds of Metal, in Engine, Oval, or Common Lathes.'. An early example of a heavy-duty industrial lathe having a tool guided in the 'X' and 'Y' planes was constructed by Jan Verbruggen at Woolwich Arsenal. The principal use of the water-powered machine was for boring cannon barrels, but it was also equipped for turning plain parts of the outer surface of the barrel. See illustration above, from Wikipedia, where higher resolution versions may be found. 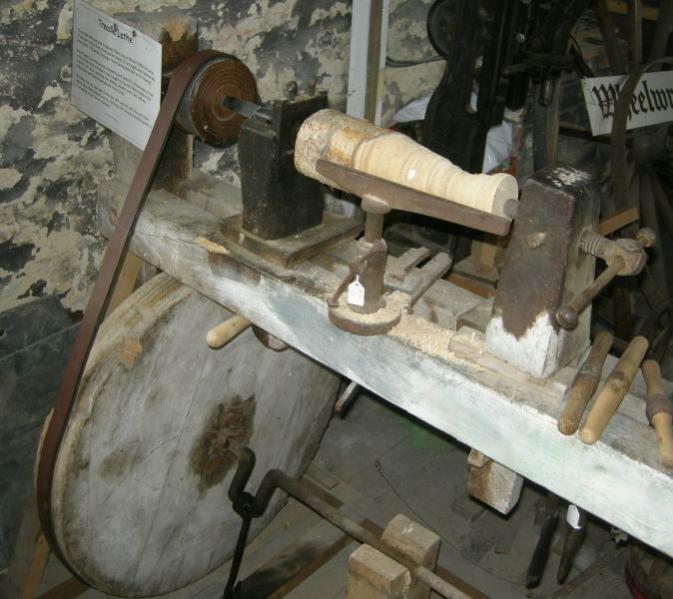 It is entirely possible that Henry Maudslay saw this lathe during his time at Woolwich Arsenal. Manchester, 1805: 'One excellent clock maker’s cutting engine, one double fluting engine, one slide lathe new, .... two pair of excellent stock dyes and taps, several screw plates, six turners lathe spindles and headstocks, two lathe frames and wheels,....'. In 1809 the sale of effects of Ridgway and Stott of Manchester in 1809 included 'sundry slide and other lathes for turning iron and copper bowls, rollers, &c.'. 1806 Advert: 'To Ship-Owners, Surveyors, Pump and Engine-makers, Braziers, Founders, and Others. 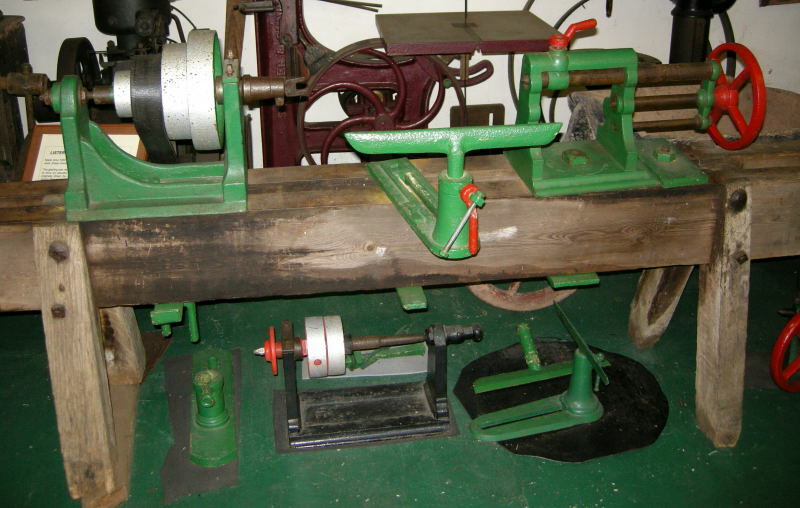 Early lathes are often found in museums. Only very rarely is the date of construction known, even approximately. It is unwise to attempt to assign a date based on the form of construction, as primitive features, such as wooden beds, continued to be adopted long after more sophisticated designs appeared. The Deutsches Museum in Munich does a fine job of presenting a range of machine tools from the 18th century up to the present day. Their earliest dated example is a watchmaking lathe made in Paris in 1741 by P.-F. Daneau (see photo). At first sight it appears highly sophisticated for its age, with the main elements being constructed of metal and made to a very high standard. Screws of five different pitches could be cut by engaging a key with one of five screwed portions of the spindle, which would advance the spindle axially as it rotated. However, it was still necessary to hold the cutting tool against the work by hand. 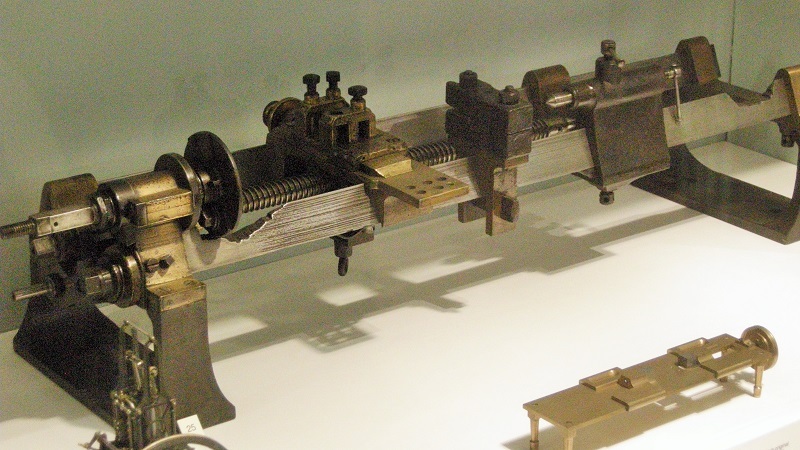 A much more complex lathe in the Deutsches Museum was made by J. Shega of Vienna, c.1767 (see photo). It is a Kunstdrechslerbank (ornamental turning lathe, engine turning lathe or rose engine). It was capable of cutting a variety of patterns and cutting screws, but again the cutting tool was hand-held. One form of construction which found favour within a fairly short window of time was the use of a bar bed of triangular section. These first appeared in the mid 18th century, and came into wider use by the late 18thC. They probably fell out of favour in the second decade of the 19th century, although several makers in Germany favoured this style for much longer. Their wide acceptance was possibly influenced by the type being adopted and made available by the respected Henry Maudslay. 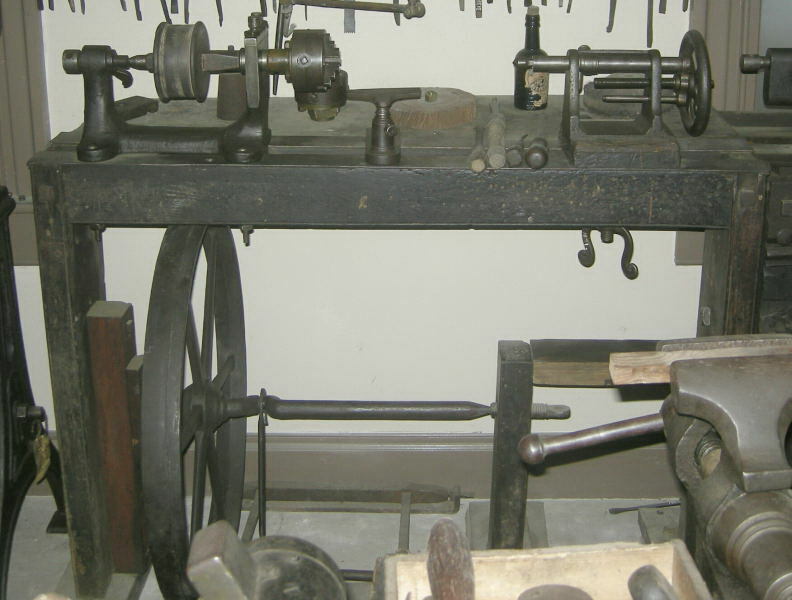 Examples of Maudslay lathes can be seen in a number of museums. This c.1805 example in Australia, originally owned by Sir John Barton, is ascribed to Maudslay, Sons & Field. However, while the slide rest is fully consistent with Maudslay's design and construction, some other keys aspects, primarily the headstock and tailstock, are not Maudslay-like. 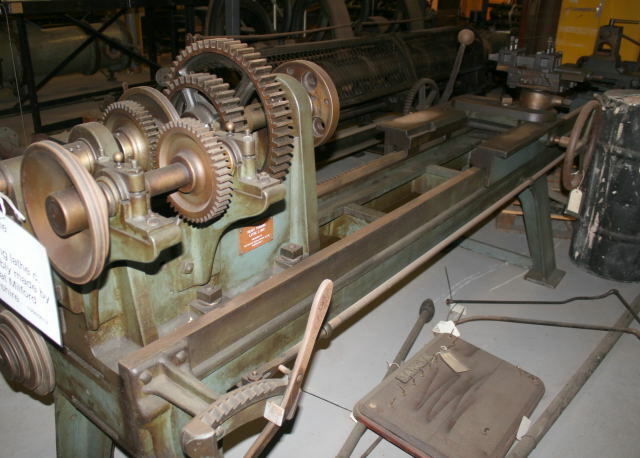 The Henry Ford Museum in the USA has an example with a two-bar bed and a central leadscrew. Unusually, the carriage is held down by rollers pressing on the underside of the slideways. The lathe was gifted to the Ford Museum by Sir W. G. Armstrong, Whitworth and Co. Photographs here. 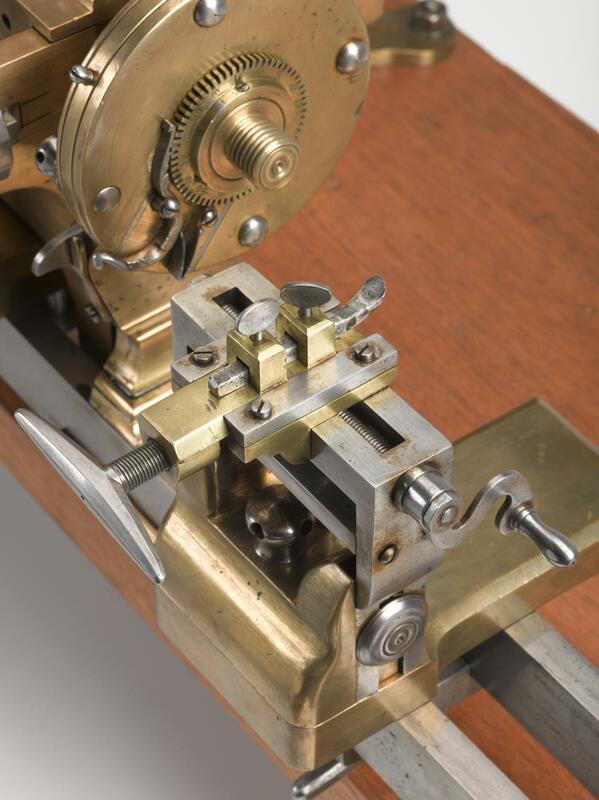 The triangular bed allowed the key components - headstock, tailstock and tool rest to be maintained in alignment, while the triangular form provided the easiest and most economical way of accurately manufacturing such a form of guidance by hand methods. Just the two upper faces needed to be made true, the quality of the underside being of little importance. Ease of hand production of the guiding surfaces was an important factor, given that the arrival of the planing machine was so surprisingly late. However, the triangular bar bed had limited stiffness due to its necessarily limited section size. A marked improvement came with the use of a pair of parallel bars, both guiding the same carriage. This appreciably increased the resistance to twisting and transverse deflection, but demanded very high standards of manufacture. 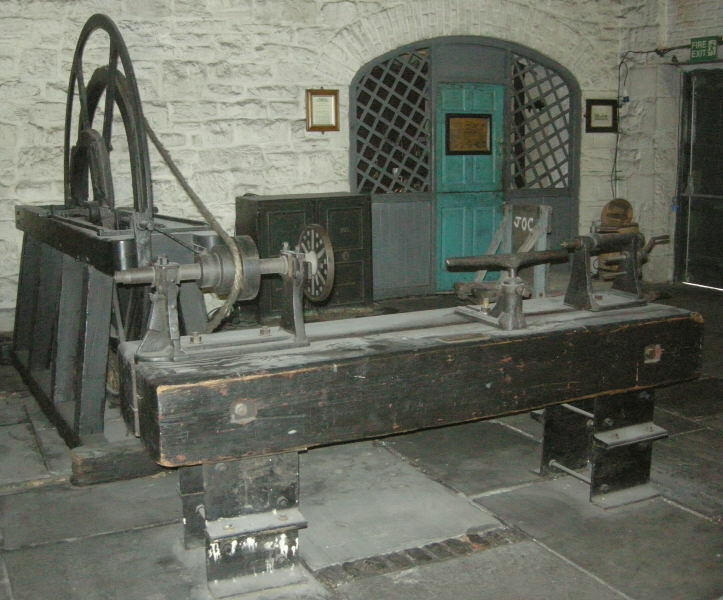 Henry Maudslay made twin bar lathes for industrial production. Henry Maudslay was by no means the first adopter of triangular bar beds, and neither was he the only prominent producer of industrial calibre examples. Matthew Murray used them on his large cylinder boring machines. They were also noted by Simon Goodrich as being used for the slideways of Matthew Murray's self-acting roller fluting engines when he visited Murray's works in January 1803. 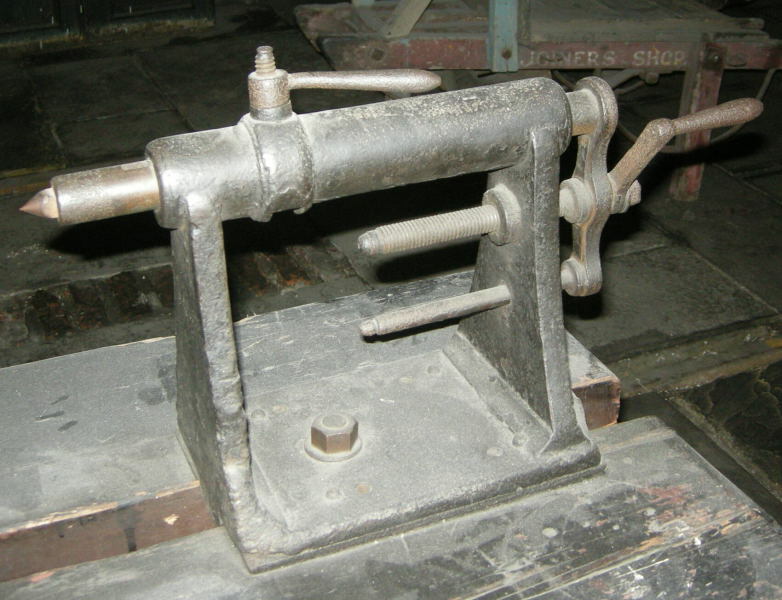 The earliest recorded example of a triangular bar bed lathe was made by Henry Hindley before 1758. He in turn influenced John Smeaton. 1796 Advert for sale of a triangular bar bed lathe: 'TURNING LATHE. TO BE SOLD, (the Property of a Gentleman,) A VERY COMPLETE LATHE, on triangular Steel bar, with apparatus for Screws and Oval Engine. Enquire Miss. Leventhorpe's, in the Square. There is a good discussion of triangular bar bed lathes here. 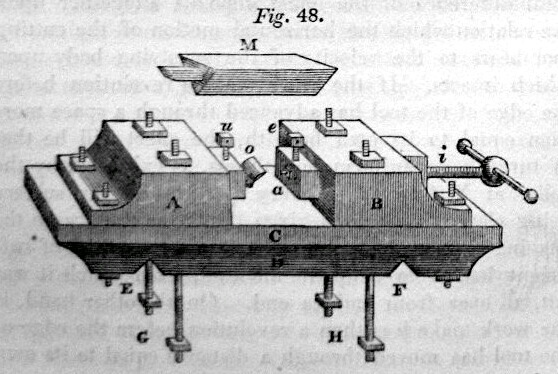 An 1813 engraving here, showing a simple treadle lathe, is intriguing because it shows an iron bed which appears to have two rectangular/triangular rails, joined together at the ends. A specialised form of lathe was used solely for cutting large screws. Highly sophisticated machines were in use by the mid 18th century for cutting small high precision screws for scientific instruments, clocks and watches. Fusee-cutting engines were particularly interesting, because they cut a thread on a hyperbolic profile. A number of inventors introduced screwcutting machines in the form of specialised lathes having the carriage traversed by a leadscrew driven from the spindle via gears. There is no reason to assume that these were originated by one person and copied down the centuries, as there are not that many alternative ways of cutting accurate screws. Andrey Nartov constructed such a machine in 1718. 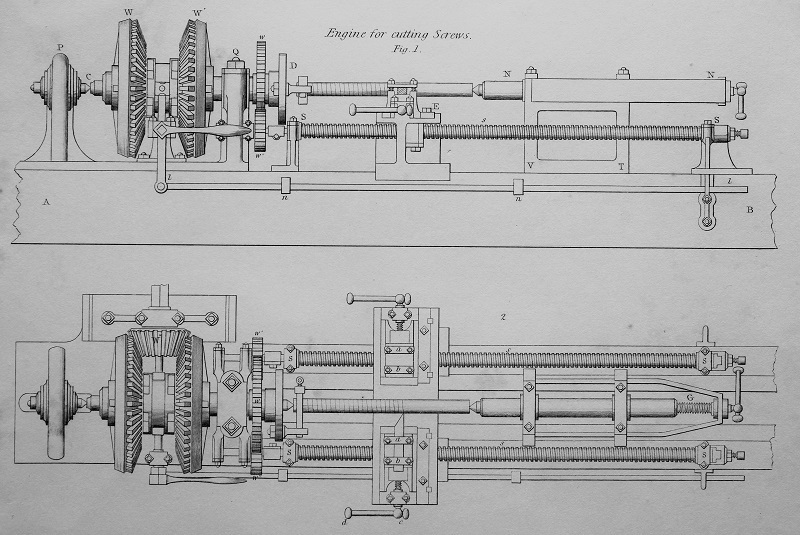 The available illustrations leave much to be desired, but a hand crank is shown attached to a flywheel, driving the workpiece and the tool carriage's leadscrew via gears. The main frame and the handwheel were probably made of wood, with the slideways probably of metal. An interesting feature is the toolholder: the cutting tool is held in a pivoting arm and pulled into contact with the workpiece by a wingnut on a screw. 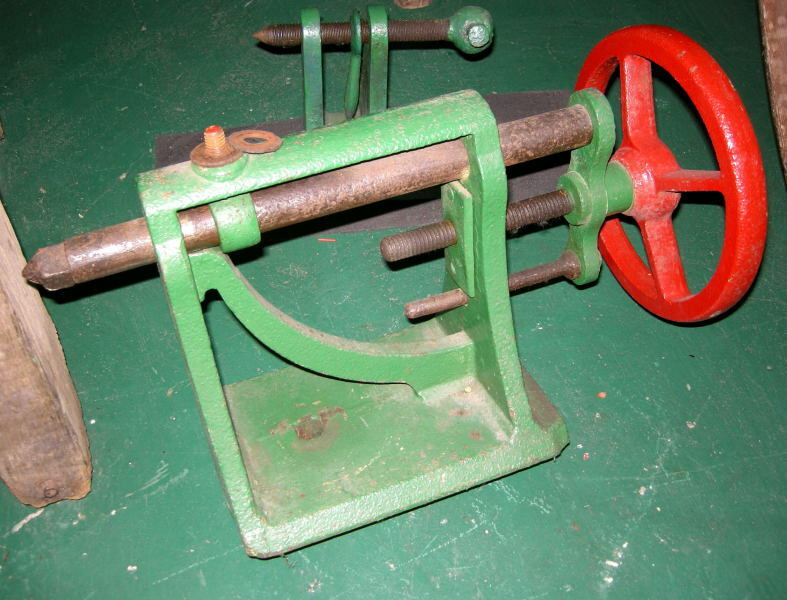 In 1741 Henry Hindley showed John Smeaton his lathe for cutting accurate screws. He described it as a 'chock' (chuck?) lathe, and Hindley showed him 'the method employed to make the threads of the screw equiangular with the axis, that is, to free the screw from what workmen term drunkenness; and also shewed me how, by the single screw of his lathe, he could cut, by means of wheel work, screws of every necessary degree of fineness (and, by taking out a wheel, could cut a left-handed screw of the very same degree of fineness)...'. c.1795 Senot in France produced the precision machine described above, which could cut relatively large screws, using change wheels to cut a range of pitches. The carriage was permanently engaged with the leadscrew, and no means were provided for moving the cutting tool transversely independently of the leadscrew. See Senot's Lathe. in 1798 David Wilkinson in the USA obtained a patent for a water-powered screwcutting machine, which he used to produce large iron screws. It could only cut screws with the same pitch as the leadscrew. A patent drawing of the machine exists, but it was produced about 40 years after the date of the patent. As drawn, the machine would have appreciable shortcomings in practical operation. An apparently novel feature was the use of a split nut to engage with the leadscrew. 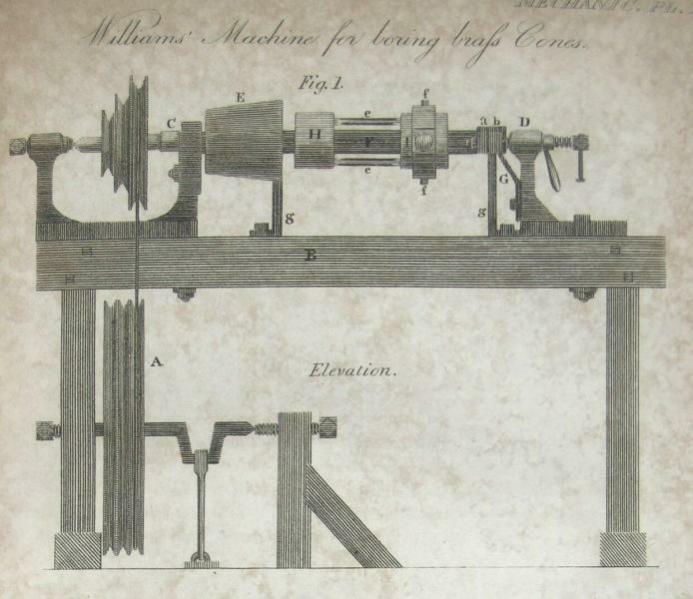 See David Wilkinson for more information about this machine, as illustrated in the post-patent drawing. The Science Museum has on display two examples of screwcutting lathes by Henry Maudslay, dating from c.1800, one of these being a model. These lathes could cut a variety of pitches by using different leadscrews and/or change wheels. For more information, see Henry Maudslay: Machine Tools. Messrs Gallimore of Sheffield were makers of large screws. Lardner described one of their turning and screwcutting in 1833 . See illustrations. It was of all iron construction. The carriage slid on V-guides and was moved by chain drive. The pitch was determined by change wheels. Deflection of the workpiece by the force of the cutting tool was prevented by a support on the opposite side to the tool. There were several Gallimores who produced screws in Sheffield. The most likely candidates for this machine were John Gallimore or Josiah Gallimore or John and Josiah Gallimore. Lardner stated that 'Messrs. Gallimore had been noted for their manufacture of large screws, especially those used for elevating the breeches of cannon during the late war'. The Napoleonic wars ended in 1815. The Encylopaedia Metropolitana included a drawing and description of a large screwcutting lathe at Woolwich Dockyard. The drawing, reproduced here, is dated 1834, and, incidentally was drawn by P. Barlow Jr. (Peter William Barlow?). Screws of any pitch could be cut by changing the ratio of the gear wheels on the spindle and on the leadscrews. There were two leadscrews, enabling cuts to be taken on each side of the workpiece. To cut internal threads, the nut or other component to be threaded would be bolted to the slide rest and a threading tool mounted on a rotating boring bar. 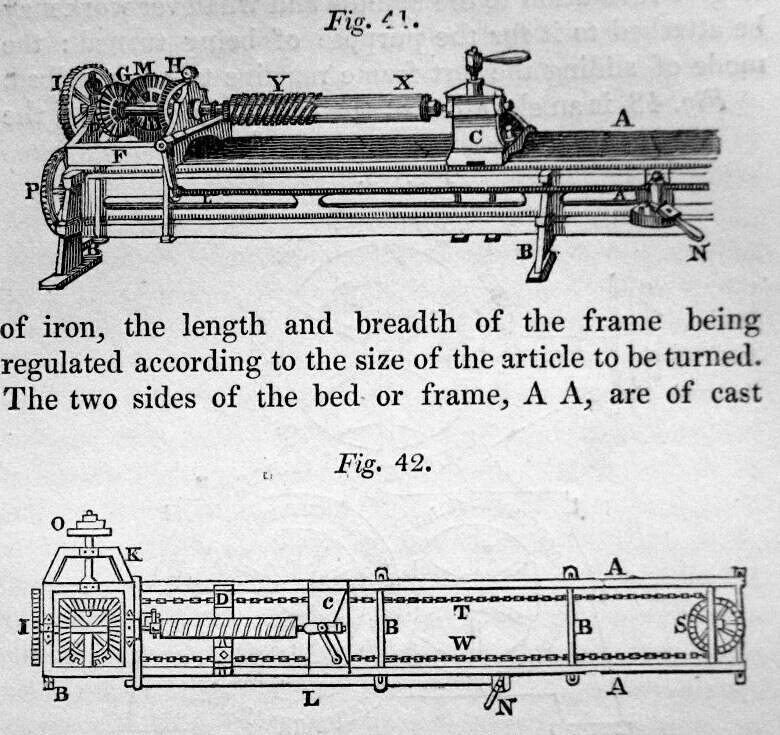 The machine was also described in the 'Cyclopedia of Useful Arts' published in 1854, where it is noted that the rear tool was intended to cut while the front tool was returning to the starting point on completion of its traverse, but this method 'does not produce very good results in practice'. It should be mentioned that Leonardo da Vinci's sketches included a screwcutting machine on the same principle, but presumably his sketches were not available to influence future technology. The Encylopaedia Metropolitana also referred to a type of machine at Woolwich Arsenal for cutting original screws of any required pitch, and described it as 'One of the neatest and most perfect engines of this kind for short screws and taps .... constructed, and, we believe invented by the late Mr. Adam Reid.. 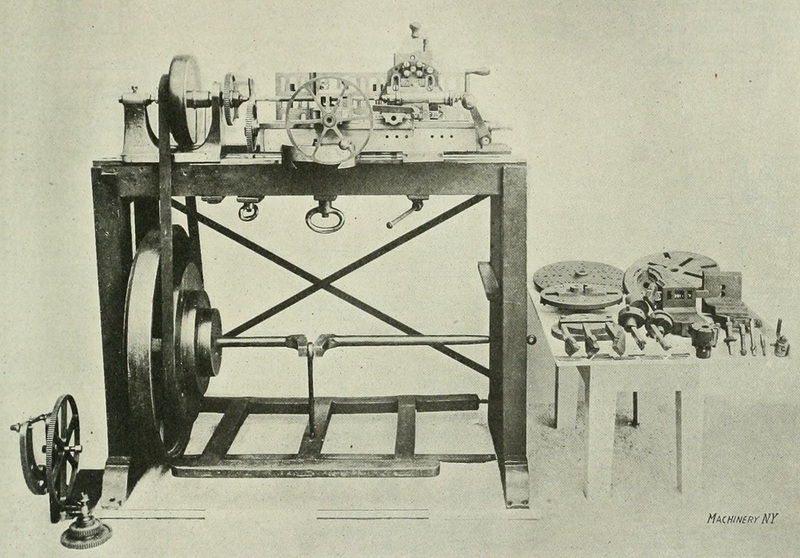 It appears that Reid's machine followed the principle of the fusee cutting machine (originally developed in France). The cutting tool was traversed by the action of an inclined plane moved by a rack and pinion, the pinion being fixed to the lathe spindle. Charles Holtzapffel notes that despite the length of the inclined plane (44"), the maximum size of screw that could be cut was limited to 1.6" diameter and 2.25" long. Towards the end of the 19th century, more or less standard forms of general purpose lathes were well established. They could be expected to be back-geared, to have compound slides, to be self-acting and capable of screwcutting, and have versatile arrangements for holding work. Lathes with these features, based on rigid iron box beds, were being produced for sale by a number of British makers from the second and third decades of the 19th century. Some examples are mentioned below. Later, British lathes could often be obtained with gap beds to allow large diameters to be turned. The carriages were often designed to hold work for boring. The adjustable gibbed dovetail arrangement removed concerns about the carriage being lifted during the machining process. These features were appealing to jobbing shops. However, the provision of a gap bed necessitated moving the leadscrew further out from the lathe axis, and this imposed a twisting moment on the carriage. Unfortunately, few early British engineering lathes escaped the wartime scrap drives. 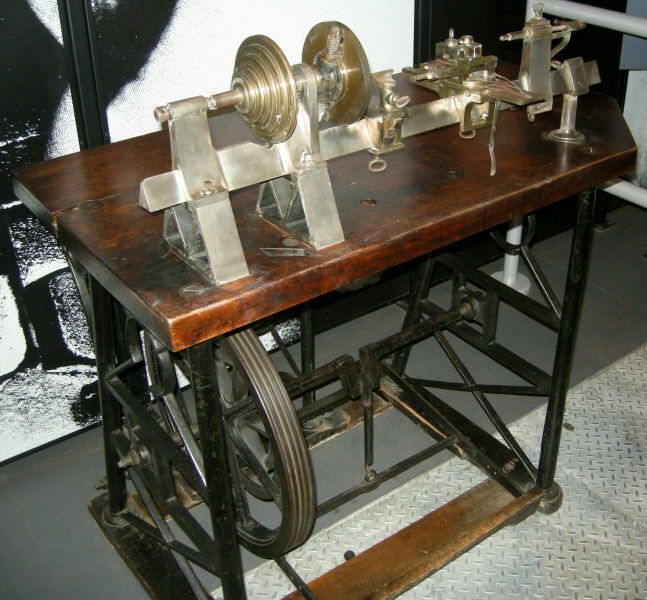 One survivor which appears ahead of its time is the 1817 machine produced by Richard Roberts of Manchester, displayed in the London Science Museum. Remarkably advanced examples were made by Fox of Derby. Two examples survive in the UK, thought to have been made c.1820-1830. For a discussion of the design features, and examples of lathes in Europe, see Fox of Derby entry. Note: From a very early date Fox adopted kinematic support and guidance for the carriages and beds of his lathes and planing machines, having one Vee guide and one flat surface. Prof. John E. Sweet, writing in the American Machinist in 1903, credited Hewes & Phillips with introducing this arrangement in the 1870s (half a century after Fox!). From the 1830s, Joseph Whitworth started building lathes of a rational design, widely imitated by numerous other makers well into the 20th century. His 1835 lathe had an ingenious arragement for providing self-acting traversing and cross slide feed. The oldest known surviving Whitworth lathe is at the Long Shop Steam Museum, made in 1839. Most British makers followed Whitworth in adopting beds with flat-topped, dovetailed slideways. These were relatively straightforward to make accurately and, importantly, allowed a good extent of support to the underside of the carriage. A few other prominent early makers preferred one V and one flat guide, Richard Roberts and James Fox being early adopters of this arrangement. This avoided the need for gib strips, and good guidance would be maintained in the event of a moderate amount of even wear occurring. Much ink has been consumed in setting out arguments about the real and supposed merits of the two basic types of lathe bed. It is unlikely that any opinions were changed as a result. Tailstocks probably do benefit from having their own dedicated V guides, but otherwise the two types have their own advantages and disadvantages. 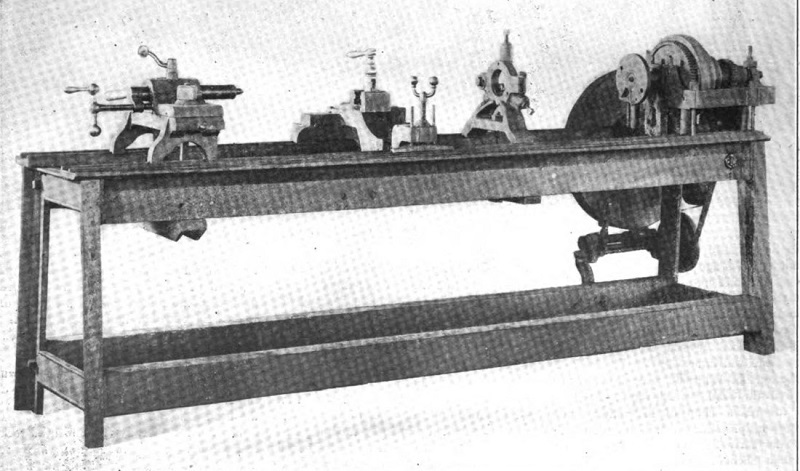 A writer in the American Machinist observed in 1899 that 'Certainly no makers of machine tools have succeeded in providing lathe carriages to move with less friction or deviation, and with more endurance than Whitworth in England and Sellers and Company in this country, who have always mounted their lathe carriages with positive gibs and broad flat bearing surfaces. Some years ago I was obliged to change a preconceived opinion in this matter by some tests made on various kinds of lathes in a locomotive shop in Sweden, where it was found that the carriages of Whitworth's lathes, positively fitted on the beds, not only moved with greater ease but could not be shaken by means of a prying bar, while carriages on angular ways in the same shop on angular ways in the same shop could be moved in almost any direction by the same means.'. The design of the early American lathes left much to be desired, but from the mid-19thC the design of the average American small-to-medium class of lathe became much more user-focused, and more productive. The typical British maker, after remarkable pioneering work, became complacent. Things changed quickly dramatically on both sides of the Atlantic after 1900, when Taylor and White demonstrated the capability of the new high speed tools steels. American lathes of the early-mid 19th century generally shared a number of distinctive and curious features. Those same features remained popular for a very long period, with few makers being willing to diverge from this conformity, despite their apparent shortcomings. Given the way that the USA would come to lead in machine tool innovation in the second half of the century, this widespread adherence to questionable features in the first half is curious, and worthy of detailed consideration. The typical American lathe of the first half of the 19th century had a number of attributes which appear inimical to both rigidity and ease of use. They often had wooden beds fitted with metal guide strips. These guide strips tended to be of narrow vee form, whose acute angle suggests high frictional forces (due to wedging action), a situation not helped by the weighted carriage (saddle) concept. On these lathes, a heavy weight was suspended from the carriage to prevent it lifting under adverse forces. The presence of the large weight hanging below the carriage had a significant negative consequence - it precluded the use of intermediate stiffening cross members between the two beams of the bed. 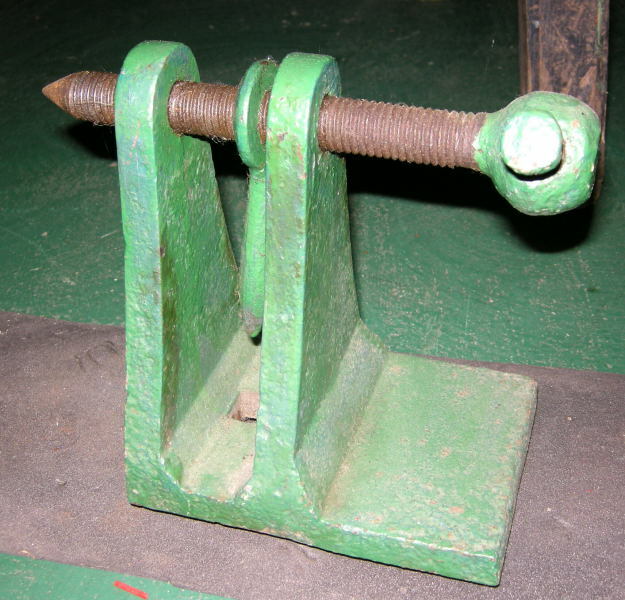 The typical carriage had two main parts, the upper part being arranged to be raised and lowered using a jacking screw to alter the tool height. Viewed in plan, the two parts of the carriage were T-shaped castings (or T-shaped on top and H-shaped below). They were of rather slender width. Modest in thickness, too: having to allow for the thickness of two castings and a gap between them was paid for by the penalty of reduced swing over the carriage. Some makers compensated to some extent by cranking the castings downwards in the middle. The upper T-shaped carriage casting was the cross-slide. Guidance on the front side relied on small, narrow ridges. These were short and provided very limited transverse movement. This limited the ability to take broad facing cuts without repositioning the tool. The slenderness of the cross-slide also limited its torsional stiffness, important when boring a workpiece with a long overhanging tool. Rapid adjustment of tool height seemed to be more important than rigidity, and the concept seems so fraught with drawbacks that there must be more behind it than meets the eye of the 21st century observer. A possible explanation is offered here , which suggests that for several decades lathe operators in the USA were disadvantaged in the availability of satisfactory steel lathe tools. The US tools would have demanded more frequent reshaping and regrinding, making quick adjustment desirable. Moving now to the headstocks and tailstocks, these were broad for stability, but the wide span between the support feet - often exacerbated by having four slender legs and small feet - caused another loss of rigidity. The carriage was moved along the bed by a chain or by a moving rack. The chain was powered from the lathe spindle via gearing or moved manually using a large handwheel located alongside the headstock. Worm and wheel gearing was provided to drive the chain wheel, typically having two worms, one above and one below the wheel. The worm shafts were interconnected by a frame, which when raised or lowered would engage one or other worm (or neither), to drive the chain in either direction. An alternative reversing arrangement used a cluster of three bevel gears. It might seem that the fixed position of the handwheel would be very inconvenient when the carriage was not near the headstock. And so it was: Many of us still remember the old chain-feed lathe with the big pilot wheel at the headstock which had to be turned to feed the carriage. 'Chordal' used to say that when a man was using such a lathe to square up an end of a shaft, he would run up to the headstock, yank the handwheel, and run back to see what happened. Chain drive is by no means ideal for moving the carriage, and some lathes used a moving rack drive as an alternative. This was probably welcomed by operators, but such lathes demanded more space, as the rack was attached to the carriage and protruded beyond the bed when the carriage approached the headstock. Not all of these lathes had a chain or a moving rack. One old example featured in 'Machinery' in 1897 had a fixed rack, whose teeth were cast integral with one of the guides fixed to the wooden bed.. When seen by the author of the article, the carriage was positioned using a crowbar, but then it was only being used for facing the ends of iron columns. He could only assume that it was originally moved by a ratchet wrench acting on a pinion on the carriage. It had an authenticated history going back to 1832, 'at which time it had already seen a number of years of service'. Over 65 years old, and still earning its crust. 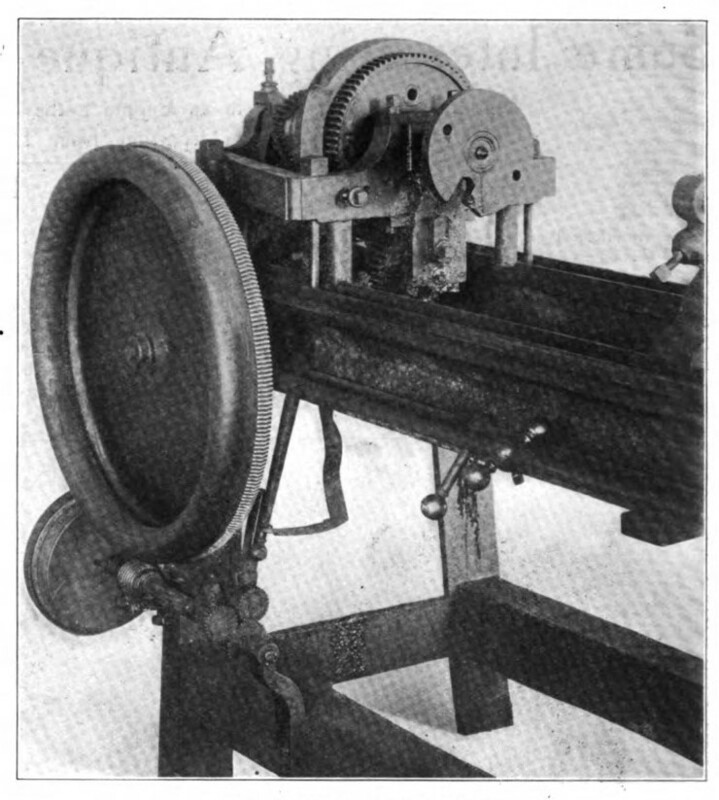 Examples of these old lathes were often featured in US production engineering magazines. Their date of construction was often speculative, but an example built by Nathaniel Wiley at Watertown seems to have been positively dated to 1830.. It had several owners before being put out to grass in 1889. See photo above (the large handwheel is missing). A well-preserved example is described and illustrated here and here . It has been attributed to Moore and Colby, evidently between 1833 and 1837. It has a rack feed, and each beam of its bed is laminated from eight pine boards. An iron weight of >150 lbs hung from the carriage. Interestingly, the lathe had a leadscrew, although it is not clear how this was accommodated. Joseph Wickham Roe is strangely quiet on the matter of this type of American lathe. The sole relevant mention is in reference to machines from one maker, Samuel Flagg, whose lathes are described as 'light and crude, with a wooden bed, wrought-iron strips for ways, chain-operated carriage, and cast gears.....'. Those 'light and crude' American lathes must have demanded heroic efforts from their operators to produce good work. A particularly character-building example at the works of Kilbourn & Lincoln in Fall River, was described and illustrated in the American Machinist in 1913 . See photo above. The author states that it was probably bought by Mr Lincoln when he started in business in Fall River in 1829. However, although he arrived in Fall River in 1829, in 1831 he was employed at the Massassoit Mill, opening the 1829 date to further doubt. 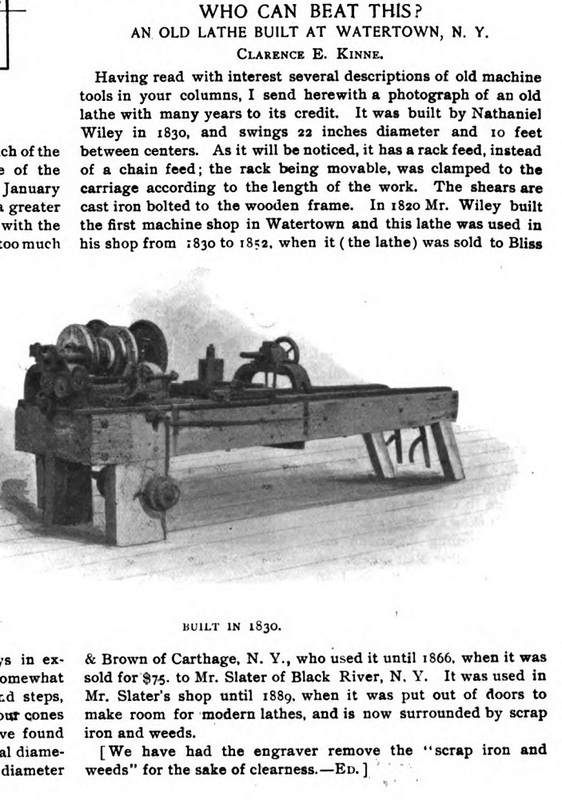 Mr E. A. Dixie, an entertaining contributor of articles on early machine tools to the American Machinist, described a lathe built by Baxter D. Whitney in 1834, when Whitney was just 17.. See photos. The lathe remained in use for over 60 years, no doubt challenging the patience of generations of turners. It had the typical shortcomings described above, including a rather slender wooden bed. 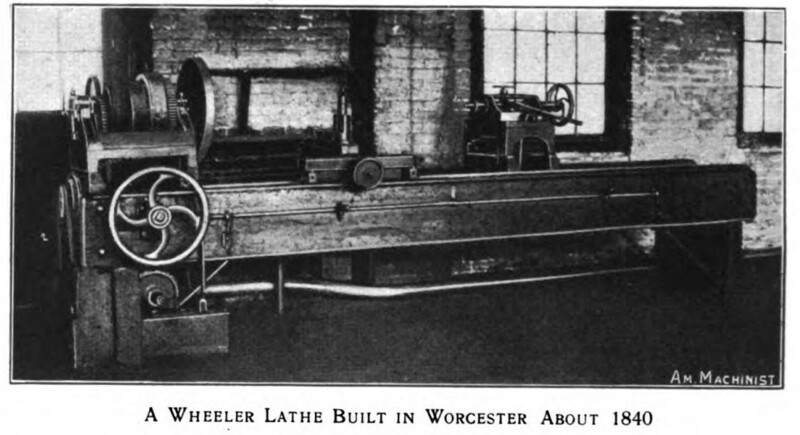 The article also described and illustrated a later lathe designed by Whitney, which had a number of improvements, including a leadscrew. The author makes some interesting observations on the measurement standards applicable in the works of Baxter D. Whitney & Son in the 1880s, as related to him by a foreman, Mr. Sawyer. The operator's life would have been made easier by the addition of a compound slide, but these are absent from known examples of early American lathes. The persistence of this type of light construction may, in part, reflect transportation difficulties. The purchaser could presumably buy a set of metal parts, and then provide his own wooden bed, perhaps to be assembled by a journeyman from the factory. The survival of many of these old lathes is a tribute to the quality of the wood and its seasoning. The heaviest individual part may have been the low-tech weight hung from the carriage! 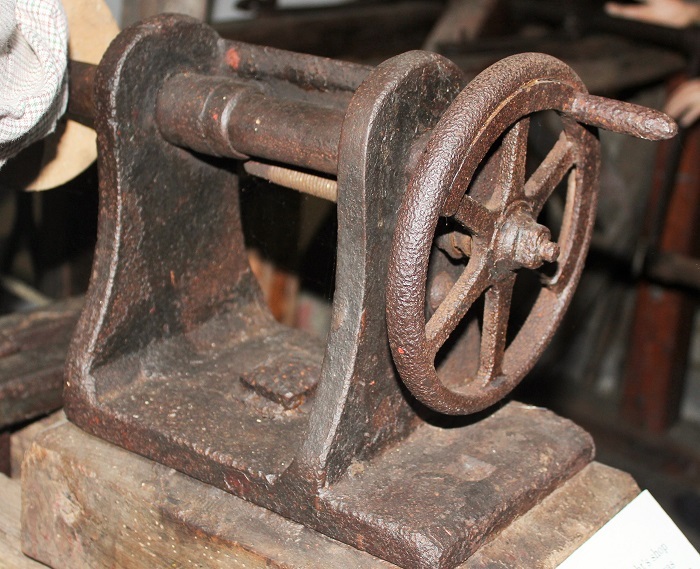 Several of the surviving examples of these early lathes were made with cast iron beds. Comparison of the rest of the equipment leaves no doubt that they were contemporary with their early wooden-bed counterparts. An example was rescued in 2012 and restored by Bruce E. Babcock in Ohio. He reported his findings in detail in a masterly series of posts in the Practical Machinist forum . He also found a similar lathe in Moffett Mill, Lincoln, RI, which could well be from the same maker. Despite their shortcomings, that type of lathe held sway in the USA for many years and often gave many decades of service, but eventually gave way to machines of much more rational design, having iron beds with efficiently-disposed material. The headstocks and tailstocks were also made stiffer. The V-guides for the carriage were made less acute, with separate guides provided for the tailstock. For some reason, the V guides were usually in pairs, rather than having the kinematic pairing of a single V and a flat way. Leadscrews and/or layshafts replaced chains or moving racks. However, some makers still persisted with the rise-and-fall carriage with its hanging weight. For example, see the Lathe and Morse lathe here. Some others who retained the rise-and-fall carriage abandoned the weight in favour of additional guides on the bed and 'fingers' on the carriage to prevent lifting. See here for an excellent account of the restoration of a Putnam lathe of c.1870. Although this is outside the timescale of 'early lathes', it does show how the old concept was updated and considerably improved. The widespread adoption and long production period of these lathes is curious, given the remarkably innovative and user-focused machine tools that would later emerge from the USA. Some, at least, or the shortcomings of those lathes can be explained by difficulties in sourcing or producing materials and components, particularly large bed castings, leadscrews, and planed surfaces. A surprising limitation was the availability of steel for the working parts, even in the mid 19thC. See Freeland Tool Works (USA) regarding steel-clad wrought iron lathe spindles. The family resemblance of these lathes suggests a common parent. Who was that parent? Robert S. Woodbury in his 'History of the Lathe to 1850' highlights just one US maker, David Wilkinson, who designed a lathe that 'came into very wide use, especially in the government arsenals', and added that 'we can be sure that by 1806 David Wilkinson, acting independently, had finally constructed a general purpose lathe with a screw drive of its carriage and suitable for extensive industrial use.' What happened to these lathes, or even illustrations of them? With screw-drive carriages, they were evidently not the lathes discussed above, which were notable for having their carriages positioned by chains or racks, not by leadscrews. Our view of the design of these lathes should be tempered by recognition of their date of construction. Unfortunately, although we know that the type was still in production in the 1840s, there is a surprising lack of reliable early dates for them. If they were available in, say, the 1820s, they would have represented a great advance on the alternative, i.e. hand lathes. In the UK, although we know that slide lathes were widely in the 1820s, and that superior lathes were available from makers including Roberts, Fox and others, we do not know much about the adequacy of the lesser-known makes of slide lathes available in the average UK machine shop at that time. As previously stated, there are many lathes in preservation whose makers and dates of construction are completely unknown. We can identify certain features on different lathes which have common design features, and hope that dating information will eventually be found which will at least allow a specific era to be assigned. The photographs on this page include examples of some primitive lathes. These may well be very old, but on the other hand their simple construction may reflect a lack of facilities available to the maker, or lack of knowledge of the 'state of the art'. The lack of dating knowledge discourages attempts to present these in chronological order, as will become apparent. A particularly primitive example can be seen at Combe Mill (see photo). Its maker minimised the amount of metal, and the number of screwed fasteners. The adjustable wooden headstock and tailstock are fixed in place by wooden wedges. One minor detail which is common to many early lathes is the shape of the head on the tailstock centre's screw. The head is forged with 14 facets, a shape commonly produced by blacksmiths, perhaps over a very long period. 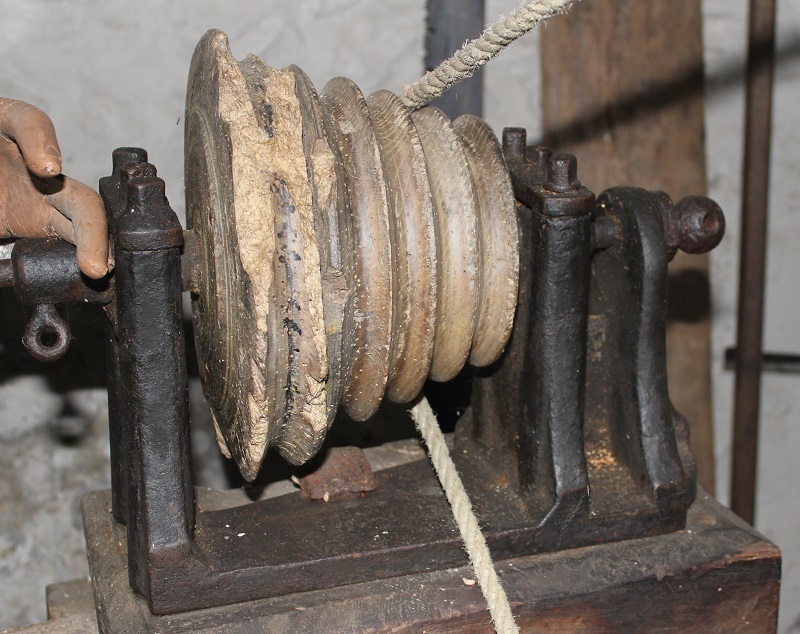 The same type of faceted screw head can be on the tailstock of the lathe at Cotehele Mill (see photo). Mention has already been made of the typical headstock design, having a tapered main bearing at the 'chuck' end, and a pointed screw to support the outboard end of the spindle and to take the thrust. An alternative arrangement had a horizontally split main bearing. Beyond this there was little scope for varying the headstock design of early lathes. The tailstock, however, offered more scope for variety. Tailstocks were also known as 'loose headstocks', poppets, or puppets. On Maudslay's tailstocks, the barrel (spindle) was pushed towards the workpiece by a forcing screw, but the screw did not withdraw the barrel. Others had a screwed spindle, while many had an indirect-acting screw, as seen in the photo of the lathe. Examples can be seen on the lathes at Tiverton Museum (see photos). It is quite possible that some of these date from the late 18thC. However, the use of handwheels might well represent a later date, despite the otherwise archaic appearance of the tailstock. Of course, a screw with a handwheel might be a later replacement for the original. The two larger tailstocks at Tiverton show a typical arrangement for locking the barrel, using a sort of eyebolt through which the barrel passed. A common feature on early lathes was the provision of a square tapered hole in the headstock and tailstock spindle to hold a centre, driving prong, or drill. 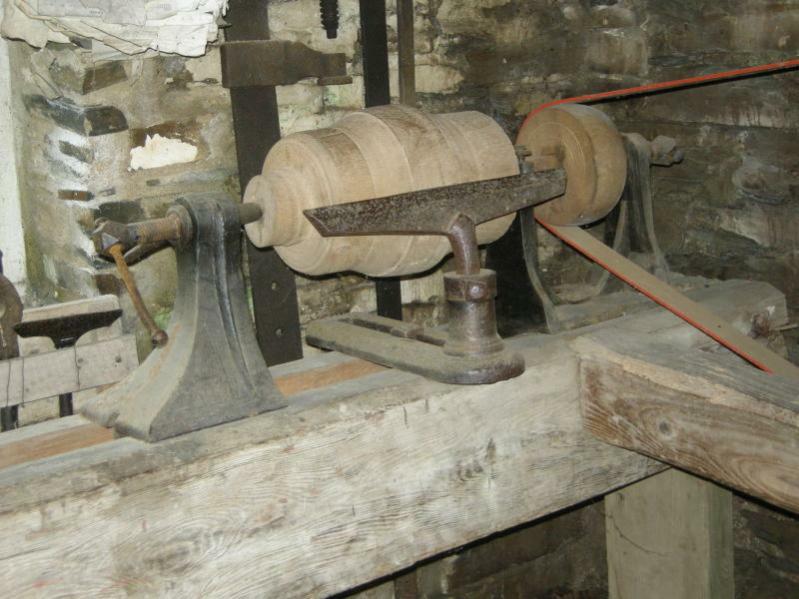 A lathe on display at Beamish Museum is said to have been used by George Stephenson in 1818. Its tailstock probably represents the next phase of development from the early type seen at Tiverton Museum. More difficult to make, assuming that the hole for the barrel was bored for a reasonable length. The headstock is unusual for the time, having split bearings at both front and rear, the front bearing presumably taking the thrust load. The Museum of Bath at Work has a fine collection of old lathes, and the first of the Bath photos shows a step forward in development. The wooden bed is clad with iron, and although the headstock and tailstock design is still basically the same, the detailed design and quality are clearly improved from the earlier examples. A number of accounts of machine tool development have been published. Most display good standards of objectivity, but all reveal some nationalistic bias, which is partly understandable in view of the accessibility of material to the authors at the place and time they were writing. A number of good books were published in English in the 1960s, written by Robert S. Woodbury, L T C Rolt, and W. Steeds. Prior to this the best known work had been written by Joseph W. Roe. Early lathe users were aware that a lathe could be used for much more than turning and boring cylindrical work. By facing the end of a workpiece using the cross slide, a reasonably plane surface could be produced (in fact the cross slide of later lathes was normally set slightly off square from the lathe axis, so as to cut a slightly recessed surface). By repositioning the workpiece in the chuck or on the faceplate, other faces could be machined flat. Or the workpiece could be bolted to the cross slide, and faced using a flycutter or milling-type cutter. No specific examples have so far been identified of lathes designed for facing flat surfaces before the 19th century. Such machines must have been used, however, for example to machine discs and wheels for scientific instruments (for dividing engines, for example). From c.1820 Johnson Jex was using his special lathe to produce a wide range of shapes. 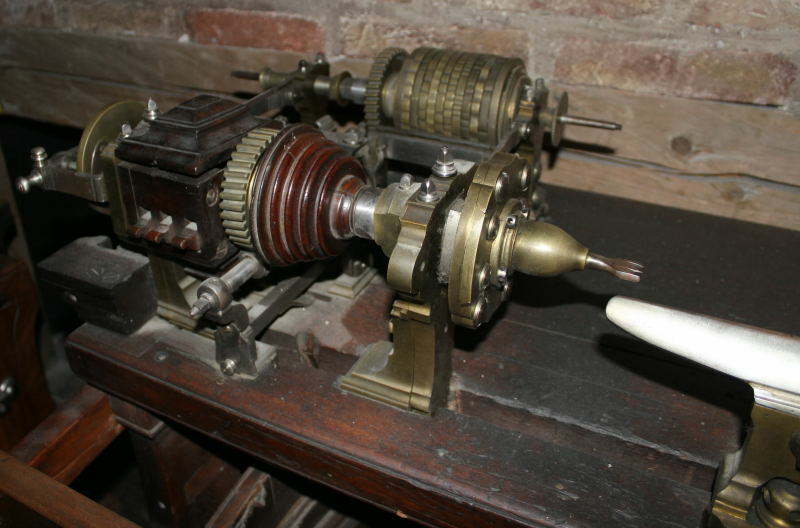 Joseph Clement adapted a treadle lathe for Charles Babbage. A description and photograph appeared in 'Machinery' in 1909, and the photograph is reproduced here . Photo reproduced above. It shows an auxiliary bed with a compound slide mounted on the main bed. It could be driven by gears from the spindle. Components were added by Clement between 1824 and 1830 which made the lathe very versatile, including the ability to do milling work. Flycutters and a facing mill with inserted cutters can be seen on the table in the photo. Lathes having a vertical axis offer certain advantages, particularly when setting up and machining components whose diameter is relatively large and the length relatively short. Nowadays these machines are more commonly known as vertical boring mills or vertical turning lathes. 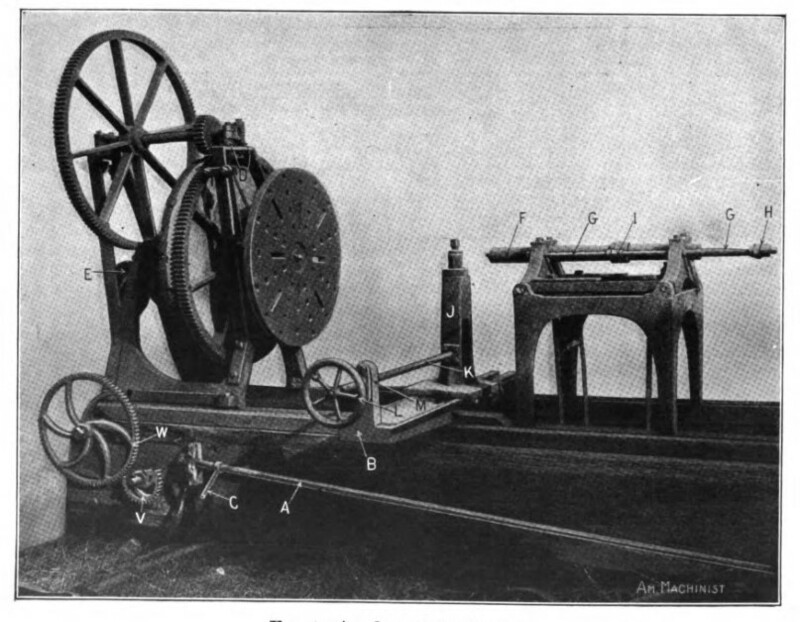 Fales and Jenks in the USA made a special purpose vertical lathe, possibly as early as 1833. Bodmer patented a machine in 1839 which he described as a circular planer, as it could oscillate to machine sectors, as well as complete circles. Turret lathes originated in the USA and represented a completely new departure in lathe design. The first examples are believed to have been designed by Stephen Fitch, Frederick W. Howe or Elisha K. Root between 1840 and 1850. Turret lathes allowed a variety of profiles to be machined on short components by semi-skilled or unskilled operators without removing the component from the chuck. This was achieved by having a selection of tools for surfacing, chamfering, drilling, boring, threading, etc., arranged sequentially on a holder (turret) which indexed round. The principle was straightforward, but much ingenuity and high standards of accuracy were needed in the design and construction. An example made by E. K. Root at the Colt Armory was featured in  in 1896. Its light construction suggests an early date. ↑ 'The Cabinet Cyclopaedia' Vol II by Dionysius Lardner, London, 1833, p.142 ff. ↑ 'English & American Tool Builders' by Joseph Wickham Roe, 1916. ↑ 'Matthew Murray 1765-1826 and the firm of Fenton Murray and Co 1795-1844' by Paul Murray Thompson, published by Paul Murray Thompson, 2015; p.298. Note: the author leaves the square brackets empty.